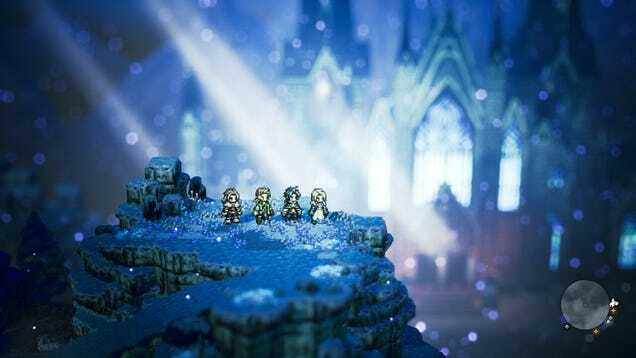 After a week with the game, I have beaten the first chapter for every character in Octopath Traveler. I know, that’s a snail’s pace for some, but I think I’ve finally played enough to draw some conclusions for my hypotheses I posited a week ago. First, I would like to say one thing about the beginning of the game as a whole. Remember the first hour or two of The Legend of Zelda: Twilight Princess? Where Link has thrilling adventures that include retrieving a basket, herding goats, and running from bees? You know. The part of that game that everyone hates. The first part of Octopath Traveler is like that, but once it’s over you have to do it seven more times. As one of the few people that liked that part of Twilight Princess I don’t find this problematic, but the comparison seemed apt. Next, I will check the validity of my hypotheses. I’ll go through them one by one, and either confirm or refute them. So long as you don’t think about it too much, it’s a lot like science! Alright this one actually threw me, I did not expect to like the combat as much as I do. The optimal strategies are clearly laid out and satisfying to pull off, and there does not seem to be much of a reliance on luck to keep things interesting. The weakness/guard break system is well implemented and gives purpose to every character on the roster. Most importantly though, it makes the boss fights feel much fairer than in other turn-based JRPGs. The bosses still have massive, party wiping attacks, but they are always telegraphed and can be mitigated or completely avoided with the right strategy. So far I have loved every aspect of the combat, leaving my first hypothesis thoroughly refuted. I was pretty much right on the money here. I think Tressa is the only standout character in the game, with Cyrus at a distant second, but they are all likable in their own way. Even Therion’s played out, generic edginess has an adorable quality to it. None of the characters feel like a waste of space, and I am legitimately interested to see where their stories go. But mostly Tressa’s. She is a gem. I was so correct in this assumption that I ended up giving the topic its own article. I have been in love with the artwork in this game since it was announced a year and a half ago (damn, that long? ), and that hasn’t changed a bit at this point. The lighting, the sprites, the subtle use of color… I am in a constant state of awe when I play this game. My favorite area is definitely Flamesgrace, pictured in the header. The quiet beauty of the wintery religious town is staggering, due in no small part to the incredible visual effects on the snow. I cannot wait to see what the other environments have to offer in the visual department. Overall, I am loving Octopath Traveler. This has taken me completely by surprise, as I never had very high hopes for the game. Considering how many people seem disappointed by the title, perhaps that is the key to enjoying it: reasonable expectations. If the game isn’t built up in your mind as this potential masterpiece, it has a much higher chance of delivering a quality experience. Whatever the reason, I will definitely be seeing this one through to the end.